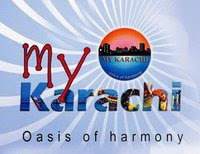 The Karachi Chamber of Commerce and Industry (KCCI) will organise "My-Karachi, Oasis of Harmony Exhibition 2011" from July 22 to 24 at Expo Centre Karachi. The KCCI generated Rs 1.70 million from the exhibition last year but this year it is likely to generate Rs 2.0 million. Governor Sindh, Dr Ishrat-ul-Ebad Khan and Chief Minister Sindh, Syed Qaim Ali Shah will attend the exhibition.